Larry William Paschke - Edmonton's Burial & Cremation Professionals | Trinity Funeral Home Ltd.
On May 28, 2016 Larry Paschke of Edmonton Alberta passed away at the age of 68. Larry leaves to mourn his loving wife of 42 years Julie, son Brett (Joanne), 3 grandchildren: Trent, B.J and Trish, as well as several nieces, nephews and extended family. Larry was predeceased by his mother Leona, father William, brother Butch, father in law Ed, and brother in law Don. professional sales rep…a happy and joyful person but most of all a dear friend..
Larry was a kind and good man with a wonderful laugh. So many good memories. A true friend who will be sorely missed. Very sorry to hear about Larry’s passing. Lot’s of great memories at Windermere. My sincere condolences. Our deepest condolences go out to you and your family, Julie. Dwain still talks about Larry and him doing karaoke at the Feedmill in Camrose. Good times! Larry will be sadly missed. Just received news of Larry’s passing – our deepest condolences Julie to you and your family. Many fond memories of you and Larry. Hey Fats, talk to Baz Nagel, & if you’ll have me, I’ll play 1st base for your team. Please accept our sincere condolences. We are thinking of you at this difficult time, and hope that your memories of Larry will give you comfort. We will always remember Larry’s infectious smile and wonderful enjoyment of life. Larry was our best friend and a very special part of our lives. We will miss him forever. We will forever remember Larry. Always the kind and thoughtful friend with a sense of fun and life. Reflecting on the news years eve and golf trip get togethers. Many laughs and remember whens. Still use Larry’s one line wisdoms in golf and life situations. Will be missed by all that had the good fortune to have met him. Just received the sad news. Jane and I would like to extend our deepest sympathy to you and your family during this sad time. “Pasch” was a true gentleman and always had a smile on his face no matter what. I have many fond memories while working together at CCM. My deepest condolences, Larry was a true gentleman and kind soul. Julie, I just heard about Larry’s passing. Eloise and I would like to extend our deepest sympathy to you and your family at this very difficult time. I gave great memories of Larry. You won’t believe the picture we are going to have at Lar’s memorial. It’s the one of you two during a CCM hockey game when you were in your pink tights! I am trying to tell my family who Freddie is! So very nice to hear from you two. Larry would have loved that. Very difficult to loose my best friend & the love of my life but I have found that life goes on no matter how crappy you feel!! My condolences on the passing of Larry. It is been long time for awhile, and i am very sorry about your husband. I don’t know he is gone in 2016. I hope you remember me though your son’s wedding plus i used to play with your son at Deaf hockey. I am very sorry about your loss and i always pray for you. I just received the sad news of Larry’s passing. My heartfelt condolences to you and your family. Once again, the great memories of the ‘Chuckwagon & the Outriders’ days come flooding back. Those were the best days of my life and the memories could fill a book. Burrellsy and I often reminisce about those days and the great times we always had. And you always figure prominently in our chats; you were always were such a ‘fun’ person to be around and I have missed that profoundly over the years. I know these are difficult times for you, but I also know that the sheer strength of your character and your wonderful personality, will guide you through this period. Would you also convey my best wishes to Jean, another special friend. I first met Larry at the hockey rink and am proud to say our long friendship continued onto the golf course. Pash was such a considerate and fun loving man, I always looked forward to partnering with him in the Ingy Cup tournament and the long drive in the Mizuno van to the Mountain Man in Kimberley. I will never forget Pash’s warm smile and robust laugh. Our condolences to Julie and the family. Our sincerest condolences to you all. Larry was such a wonderful guy, thoughtful, generous, and always good for a laugh when you have had a tough day. I will miss “Pasch” a lot and although our paths only seemed to cross once a year at the buying show since I left Edmonton, it was like you had seen each other the day before with how free the conversation flowed. I have fond Windy memories of Saturday AM games with “the guys” and I am better person in what I do today because I knew Larry. Sad to learn of Larry”s passing, our thoughts and prayers are with you. So glad to have seen larry a few days before he left us. He was a good friend with a great personality and always had time for you. He was so supportive to my son in his bike racing and hockey, just a good guy. Larry was truly a remarkable and kind man. He always seems sincerely happy to see people he knew when he entered a room with that cheery smile of his and was very loyal to his friends throughout the many years we knew him. Larry made such a huge impression on so many people and has left a ton of memories behind. Julie and your family, we wish you all the strength in the world to get through this extremely difficult time in your lives. Cherish the many endearing memories you have of Larry and know that there are lots of friends and family that are here for you. We love you, Julie. Take care. My condolences on the passing of Larry. What a man. Generous, warm, giving and positive. I really don’t remember a time when Larry’s smile and warmth didn’t light up a room. He will be greatly missed. Larry will be surely missed.I always appreciated his help when making buying decisions.He made us very comfortable and enjoyed his good nature.He was very much a friend to the golf pros. Thinking of you all. We have many good memories of many fun times. We are so sorry about Larry’s passing. Please accept our sincere condolences. To us Larry was a kind and generous man with many good friends, but he always gave us a heartfelt greeting whenever we got together with him. We will have many fond memories of the good times we had with him and yourself both off and on the golf course. Dear Julie..I am saddened to hear the news of Larry’ passing.My sincere heartftelt thoughts are with you and your family. I am shocked and saddened by Larry’s passing. As a great high school friend, room mate and life long friend, I feel like a part of my life has been taken away. Julie and Larry are two of my very favorite people. The world has lost one of the best! To Julie, Brett and family I send my sympathy, support and love. I would like to take this opportunity to forward my deepest sympathy to you all at this time of great sadness. I have indeed been blessed to have known Larry for many a year due to the Men’s Mountain Golf Classic which began in Jasper Park Lodge. I have amassed many great memories of special times together & I am truly thankful that I was lucky enough to meet Larry in the 1st instance and of course being able to spend some precious time with him in April this year. I apologise that due to my current health that I won’t be able to fly over there from UK but rest assured that I will be there in mind. A one off, remarkable, generous, kind, honest and beautiful person that I, like many others, shall miss immensely. I shall remember and treasure those time & will always remember this great man. Be strong, Larry is at last in peace and please, please try and remember all the good times you had with him and what he freely gave to us with joy. Thank you Larry for being you, thank you for many years of friendship and kindness. Rest in Peace. Our condolences go to Julie and family,Larry and Julie are so special to us and we are lucky that we have been able to spend time during the many summers at BBQs and on the golf course especially at Trickle in the mountain man.We will miss his laugh and his thoughtfulness to everyone he came in contact with.A true friend in every sense of the word. Our sincere condolences on the passing of Larry. Earth has one gentle soul less and Heaven one more angel. Dear Julie,Brett and family,Betty and I wish to convey our great sorrow for you upon the loss of Larry. We will remember your kindness to us at all times. 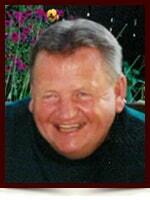 Larry was indeed a joyful person,our many great times on the golf course and in social settings were brilliant. I will miss him and think fondly of him often. I hope you will find some comfort through your family and friends. I was planning on calling Larry to insist he come for our 50th school reunion in June and am so sorry to hear that he has passed away way too soon. I cherish the memories of our relatives always together for the special days when we were kids . My thoughts and prayers are with you , Brett and your family at this difficult time. I hope to be there on June 11.